Doha, Qatar, May 1, 2018: Qatar Development Bank (QDB) today, in the presence of distinguished guests, announced the launch of “QDB Investment Forum” with an aim to attract global venture capital firms to set up their base in Qatar in order to facilitate the exchange of knowledge, service, and expertise for the Qatari SMEs and entrepreneurs to empower them and to drive growth. Held at Hilton hotel on May 1, 2018, the event saw the official agreement signing with the head honchos of five funds including Mr. Alexander Wiedmer, Partner at Iris Capital; Mr. Murat Aktihanoglu, Managing Partner at Entrepreneurs Roundtable Accelerator (ERA); Mr. Numan Numan, Managing Partner at 212 Fund; Mr. Vineet Kapur, Partner at IDG Capital; and Mr. Aziz Mebarek, Founding Partner AfricInvest. During the Forum, QDB announced “Fund of Fund (FoF)”, which is the process of yellow service investing into VC funds with the purpose of getting exposure to great international companies, bring them potentially to Qatar, set up their offices here and ensure that they actively contribute to the entrepreneurial ecosystem, ensure sufficient liquidity and help Qatar start-ups scale up globally. Through this service, the bank’s long-term goal is to create a significantly large and diversified investment portfolio in VC funds so that it can then list the shares of yellow services as fund of funds. In yet another initiative, through “Access to international capital” service, the bank’s incubated or financed Qatari star up companies will get access to present their ideas and concepts to international funds and seek additional follow on investments/financing. The one-day event included a demo day/pitching session for the entrepreneurs who have raised investments from QDB under the Seed Funding program and the SME Equity Program, as well as interesting discussions around varied entrepreneurial related topics, led by subject matter experts. 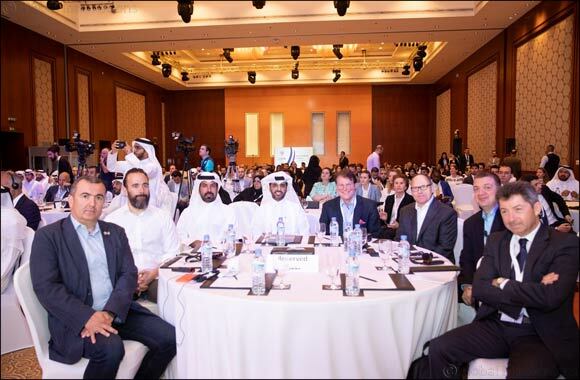 This power-packed event, which was attended by Qatari Entrepreneurs, both start-ups as well as established ones, along with the local and international investors, including international VC funds and QDB, offered a great opportunity for them to connect and establish dialog. This was also a stage to understand the nuances of future of start-up financing landscape. “Today, we were able to sign agreements with five international investment funds to open offices within the State of Qatar to attract foreign capital and investments for small and medium-sized Qatari enterprises, this demonstrates the confidence of foreign investors in the economy of Qatar. This is a practical step by which Qatari entrepreneurs and small and medium-sized enterprises can be made available to venture capital, a key component of the entrepreneurship system. It is well known that Qatar has been ranked first in the Arab world in Global Entrepreneurship Index 2018 while securing 22nd position globally, released by The Global Entrepreneurship and Development Institute (GEDI), which indicates the maturity and health of the entrepreneurship ecosystem that helps attract global funds to invest in Qatari potential small and medium enterprises. QDB’s plan is to transform Qatar as the preferred destination for entrepreneurs, mentors, investors, supporters and other important constituents to meet and exchange goods & services, in a fruitful collaborative environment and liquid markets. The purpose is to create a successful entrepreneurial ecosystem, as well as enable Qatari companies of all sizes to become strong and capable of competing globally.